With a partially frozen lake and majestic Colorado mountains as the backdrop, Volvo unveiled a newcomer to the lineup today: the 2017 V90 Cross Country wagon with the higher clearance and capability that are the hallmarks of the Cross Country models. Volvo has never had a V90 Cross Country before. The new rugged wagon slots between the V90 wagon and the XC90 SUV. It fills a gap left when Volvo discontinued the XC70 last year even though the new wagon is larger in size. The wagon, which goes into production in Torslanda, Sweden, at the end of the year and on sale in March 2017, was unveiled simultaneously in Colorado, Malmo, Sweden, and Zurich, Switzerland. Starting price is $56,295. The addition to the family builds on an upswing in Cross Country business. Volvo has Cross Country versions of the S60 sedan and V60 wagon. The V90 Cross Country has the on-road drive characteristics of a wagon but with 8.3 inches of clearance, fifth-generation Haldex all-wheel drive system as standard, hill descent control, and skid plates. The new architecture of the 90 Series made a Cross Country version possible. The 2017 V90 Cross Country is powered by Volvo’s 2.0-liter four-cylinder engine in both T6 and T5 configurations. T6 models use both a turbocharger and a supercharger to generate 316 horsepower and 295 lb-ft torque. The T5, with just a turbocharged 2.0-liter, will also be available at launch but a T8 hybrid is still under review. The engines are mated to an eight-speed automatic transmission. Hakan Ivarsson, who leads full-size car development at Volvo, said it has double wishbone and air suspension in the rear. 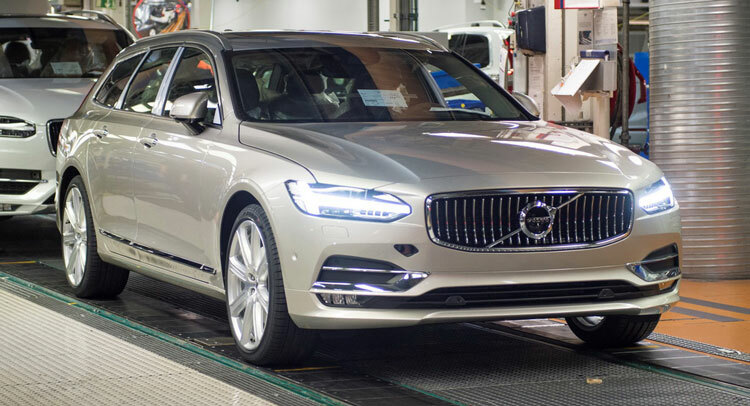 Style-wise, the front adds black gloss and a fancier grille and Volvo’s now signature “Thor’s hammer” design element remains in the headlamps. Black gloss also replaces metallic trim around windows for a sleeker side profile. The wheels have been set wider and tires have a wide profile and are softer and more rounded to absorb uneven surfaces. Inside, it’s Scandinavian sanctuary at its best, said Tisha Johnson, senior director of design for the Volvo Car Group, with black walnut porous finish that looks rich. Pearl stitching adds further detail. Amenities include massaging seats and Apple CarPlay. Lex Kerssemakers, CEO and president of Volvo Cars North America expects total V90 sales to be 5,000 to 6,000 a year. The majority will be the Cross Country which appeals more to the adventurous off-roading buyer than the XC90 crossover, said Bodil Eriksson, executive vice president of product, marketing, and communication. The original 1997-2000 Volvo V70 XC was popular in Sweden and North America because it could handle rough roads and bad weather better than a regular wagon or sedan. The second-generation V70 XC had even more ground clearance when it arrived in 2001. The third generation debuted in 2008 as a more luxurious vehicle.